Can you believe that it has been nine years since this photograph was taken. Images like this don’t happen very often and for me it still stands as a reference point. This was the early days of my photography, vintage digital shall we call it. 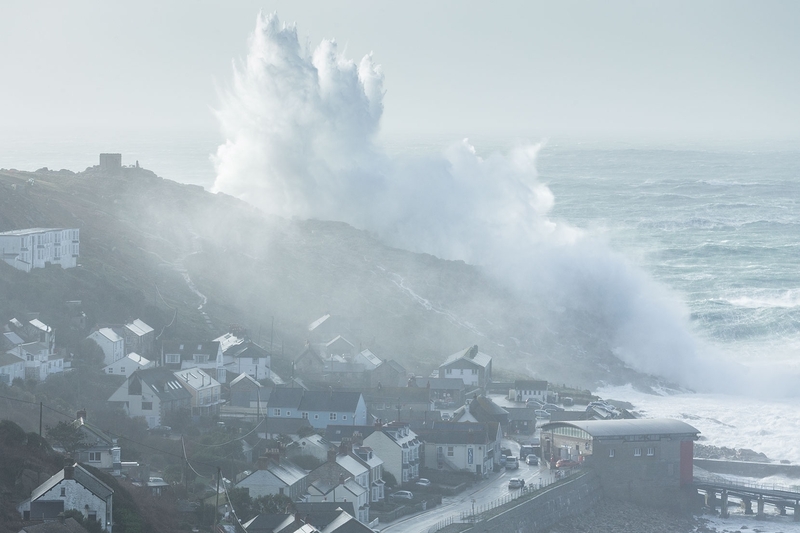 In December 2007 I was at Porthleven, watching in awe as waves submerged and clawed at the exposed and vulnerable seafront houses, but just like the weather I to was unsettled. It certainly wasn’t the stadium affair that it is now. You know the mix - thriller seekers and their factions - Dad’s Xmas DSLR to Flickr's premier shooter SpangleBucket - from iPhone Youtubers to 500px tick boxers - and why not, let's have a party. Yet back in 2007 it may surprise you to know that I was the only serious photographer there. With the waves and wind came heavy cloud unleashing squally rain. As I tied a Tesco bag on my head and shot a few lacklustre frames, I realised I was trapped, stuck in a small valley, shooting east and dreaming west – perhaps there was an even bigger catch. 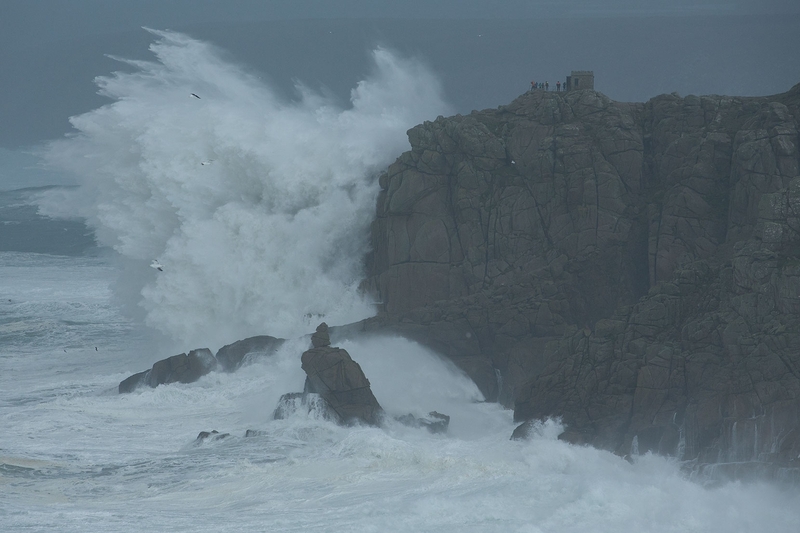 Land’s End was a hell of a risk to take at 4pm. It was a hectic 40mins drive, leaving me just 15mins of photography before sunset. Remember, these are the days before smartphones, before webcams and to refreshed weather updates, updates that I think tamper with your intuition. No Flickr or Facebook to check either, you know the tools that photographers use to spy on each other - it was a vision of elation, a big idea calling you onwards. That evening it was a Skoda Felicia estate, an irritating Satnav, McCoys Salt and Vinegar and bloody-minded will that got me there in those dying minutes. So yesterday, there I was again, standing behind the same disused café, except this time I’m dead posh – (port outwards starboard home… did you know that?). I have a case with a 600mm f4mk2 inside, a 1Dx and a bag full of other elite weaponry should I need it. I also have nicer fabrics and this time, I even have kitchen roll. Before the finale, let’s go back an hour - After a cone of chips in Sennen, I parked in a quiet field gateway on what turned out to be the busiest cul-de-sac in Cornwall. I crossed the road to view the town beneath, cowering at the mercy of the monster explosions, draping curtains of spray over the hillside. I also shot some shot video this time, something I could have only dreamed of on my 5Dmk1. With side light catching those airborne waves, the grey was lifting to clear skies. It was time to make a dash to the cliffs once more, but unlike before I now had plenty of time. As I staggered along the path I scanned the horizon for rogue tripods like a pirate. Ever since I took the first shot ‘Detonate’, I was convinced the location would become a storm chasing box tick and when the next storm hit and I would have to take a deli ticket to get my pitch. Yet once again, like last time, I would be on my there on my own. Porthleven was crowded apparently, Sennen was too, but as the light began to lift, the waves were caught in strong sidelight and it was clear to see which location was the photographer’s choice. The Canon 1Dx and 70-300mm f4-5.6 L IS are the perfect partner here and I have to say I am still thoroughly amazed at the images that this combination produces. There is something about the sharpness and clarity of that lens / sensor team that is unlike any other cameras I have owned. 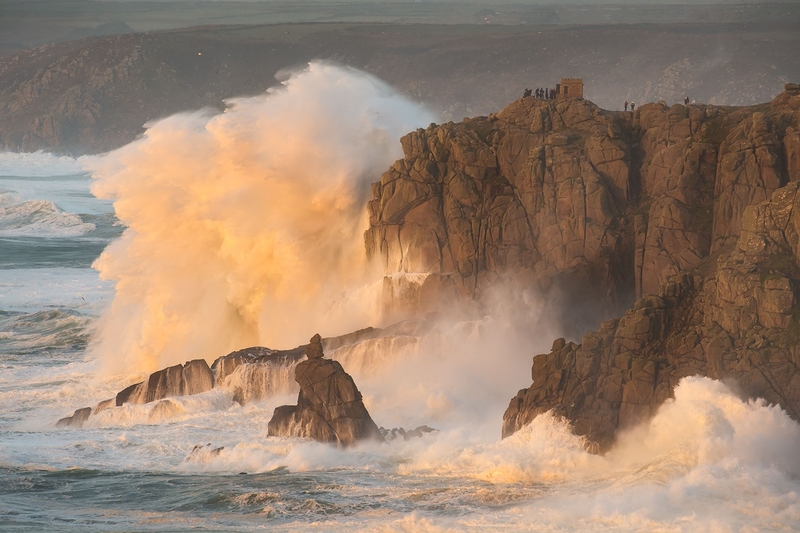 As the waves battered the cliffs I shot reserved bursts and single images alike, tripod mounted for compositional reasons. 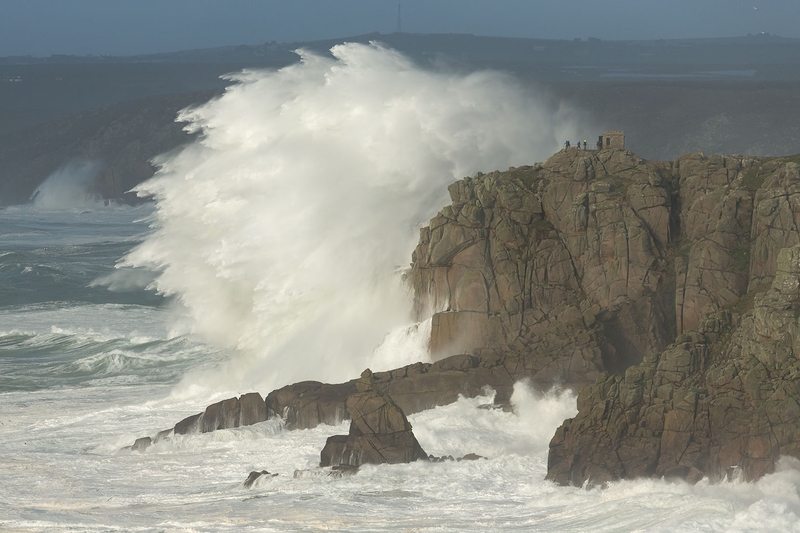 You don’t need fast ISO’s and super fast shutter speeds when you are hiding around the back of a building – ISO800, f8, 1/400th sec was adequate to stop camera shake from the buffeting Atlantic gales. The problem with photographing any coastal storm is wind. 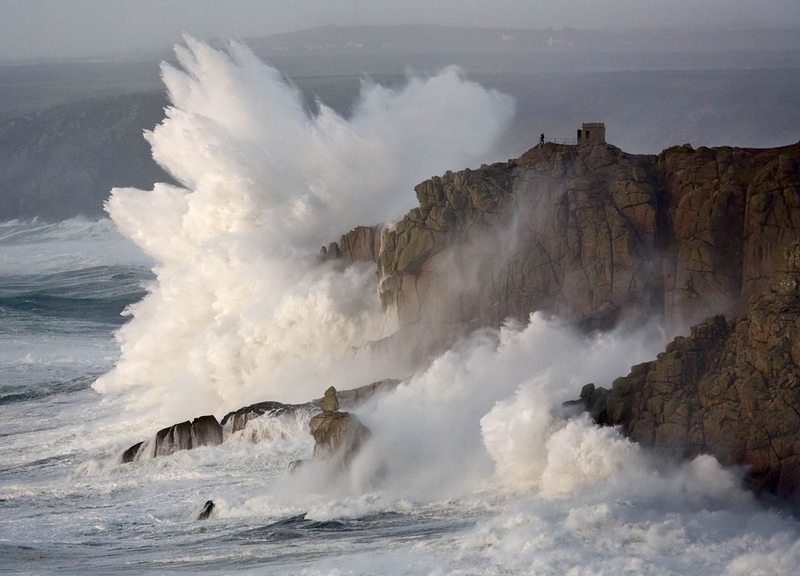 Weather systems generate huge swells that lift in height as the ocean floor rises to the shore. 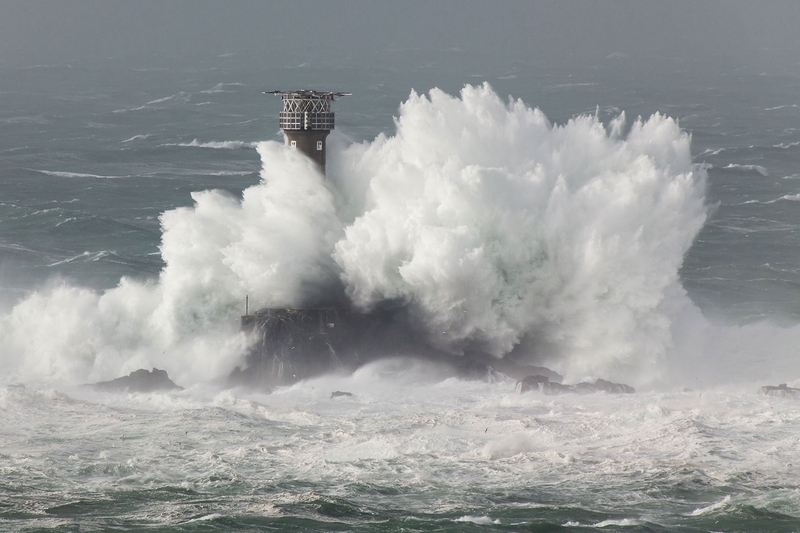 If the waves collide with a reef a mile out to sea, they explosions can be gargantuan, but high winds do little to help, reducing the energy in 100ft high spray to lumpy unphotogenic shapes. 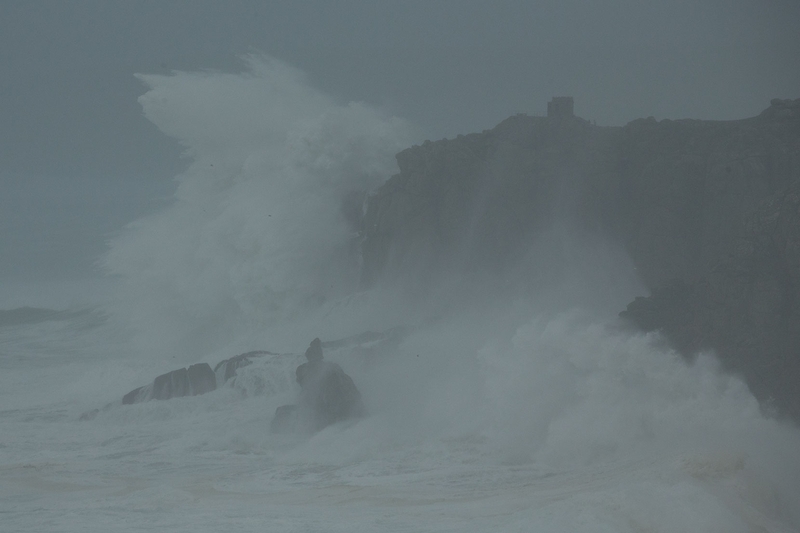 The ideal winter storm would last 24 hours, reach the coastline around 10pm with 60mph winds that die off overnight and leave those huge waves to blast into cliffs for the rest of the day, high tide at either dawn or dusk. I am yet to see one. As the sun dropped into another bank of cloud, the light became very strange. The high definition faded to almost monochrome, yet it produced some interesting results even though the light was reduced to a minimum as visibility was good. Is that it? I kept glancing left at the 600mm and then south west to Longships , but it was not delivering. Every explosion that hit the reef was carried off towards the northeast by the still raging wind. The low cumulous bank that was blocking the sun was getting lighter underneath and a few minutes later the impossible happened. Golden light bathed the cliff and enriched the seas with cyan as the waves pummelled the cliffs like cymbal crashes to the reach the crescendo of a symphony. So there you have it - A storm called Imogen apparently…i'm not really into naming cars, guitars and certainly not storms for that matter. She sounds quite the opposite of a storm, perhaps a weather girl, or maybe a shy yet intriguing girl you become infatuated with at sixth form, not the name of a thousand mile wide spiralling vortex of destruction. Then again, I have met girls like that before.